Satellite view of Tropical Storm MATTHEW in the early morning of 24 September 2010 as the system continued tracking along a route of 280 N, as it approached the landmass of Central America. 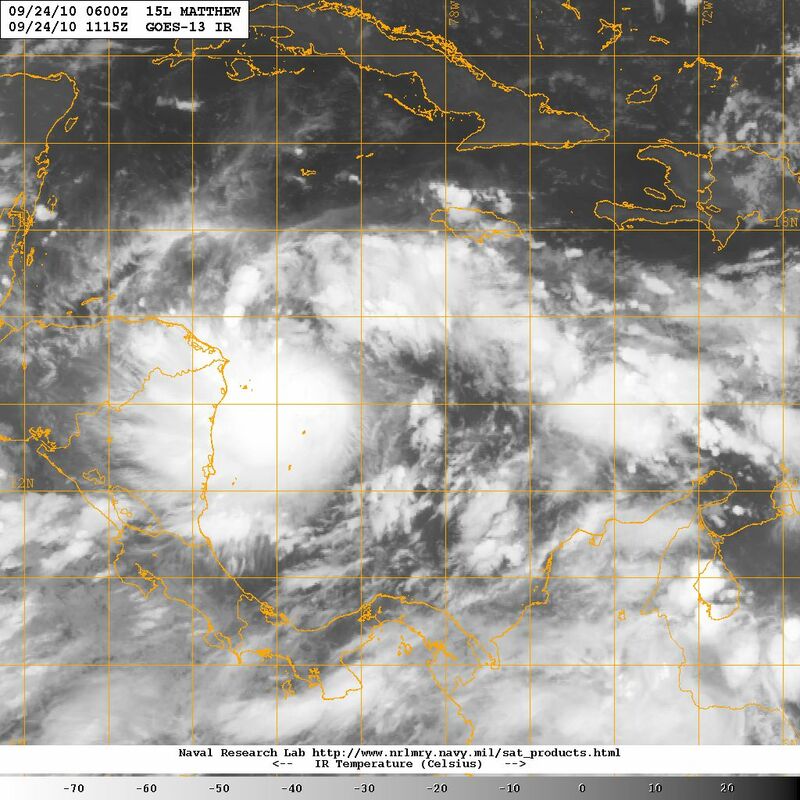 This morning, 24 September 2010 at 0500 EST, Tropical Storm Matthew was located at LAT 79.8W LON 14.3N still moving generally to the west (approximately 10 degrees north of due west) at 16 mph (25.6 kph) with sustained 50 mph (80 kph) winds and higher gusts, generating large amounts of extreme rain mainly to the west of the center of circulation. By staying on this track during the night Matthew has not only gotten closer to the landmass of Central America increasing the probability of making landfall somewhere near the Nicaragua-Honduras border, but if also has in effect “forced” the models used by the National Hurricane Center (NHC) to “rethink” the projected track. As the storms develops further in the next 12 hours or so, it is entirely possible that new adjustments will be made to the projected track for Tropical Storm Matthew. Latest forecast track for Tropical Storm MATTHEW developed by the Navy Research Laboratory on 24 September 2010, based on data from NOAA National Hurricane Center. Notice the large level of uncertainty as the projected track moves up the Yucatan peninsula 48 - 72 hours from now. Matthew’s latest projected track, based on the consensus of the various models and the interpretation and judgement of NHC’s experts, has the system making landfall as a moderate tropical storm somewhere near Cape Gracias a Dios in the Nicaragua/Honduras border, penetrating into Honduras along the northern coast to then emerge over the waters of the Gulf of Honduras to make a second landfall, this time in southern Belize as a moderate to minor tropical storm. Models then have the storm veer toward the north traversing the Yucatan peninsula near the border between Campeche and Quintana Roo states far away from coastal urban centers in both states, including the tourist resorts in the Mayan Riviera and Cancun. Under this scenario it appears that the storm will weaken considerably while over land or possibly dissipate, however there remains a possibility that the remnants of the storm may emerge over the warm waters of the Gulf of Mexico to reorganize and even re-curb toward the northeast threatening Florida toward the end of next week. Five-day projected track for Tropical Storm MATTHEW from the NHC on 24 September 2010 at 0800 EST. Clearly this is a vastly different scenario from the one we had last night, which projected a tropical storm flowing directly into the Gulf of Honduras to strengthen to category 1 hurricane force before making landfall in northern Belize to then attack Chetumal and the coastal region of Quintana Roo state to eventually emerge over the Gulf and re-curb toward central Florida. This illustrates the tremendous challenge faced by NHC forecasters who need to input parameters into the models to initialize and feed models, which at best produce simplified idealized models of the very complex and interactive natural processes taking place in the coupled atmosphere-ocean-land environment. In the case of Matthew even though the large aggregation of storm cells and rain was identified as it congealed to the east of the Lesser Antilles 4 – 5 days ago triggering constant monitoring by the NHC, it was only early yesterday that initial rotation started and a central point (a “proto-eye”) of low pressure was identified allowing the model to get a fix on a starting point from which to project future movement. At the same time numerous other parameters, including meteorological factors from the western and central USA, as well as over Central America, the Eastern Pacific and the Caribbean, had to be taken into account to provide parameters for the models. In summary, before yesterday we could only “guesstimate” where this cyclone would go, and even now that the models are working with plenty of data the level of uncertainty especially beyond the next 48 hours remains quite large, to the point where the so-called “cone of uncertainty” resembles a huge balloon once the projected track gets over the Yucatan Peninsula, which means the margin of error is quite large. However it must be recognized that the NHC capability to accurately forecast the movement of tropical cyclones has improved significantly in the past 25 years. Certainly the performance with previous storms this year and in recent Atlantic hurricane seasons has been quite good, a true testimony to the experience and accumulated expertize of the professionals who serve at the NHC.